Let your Passengers follow along with Passenger, see your Route Line in Profile View, and declutter the map with Airspace Hiding by Altitude. 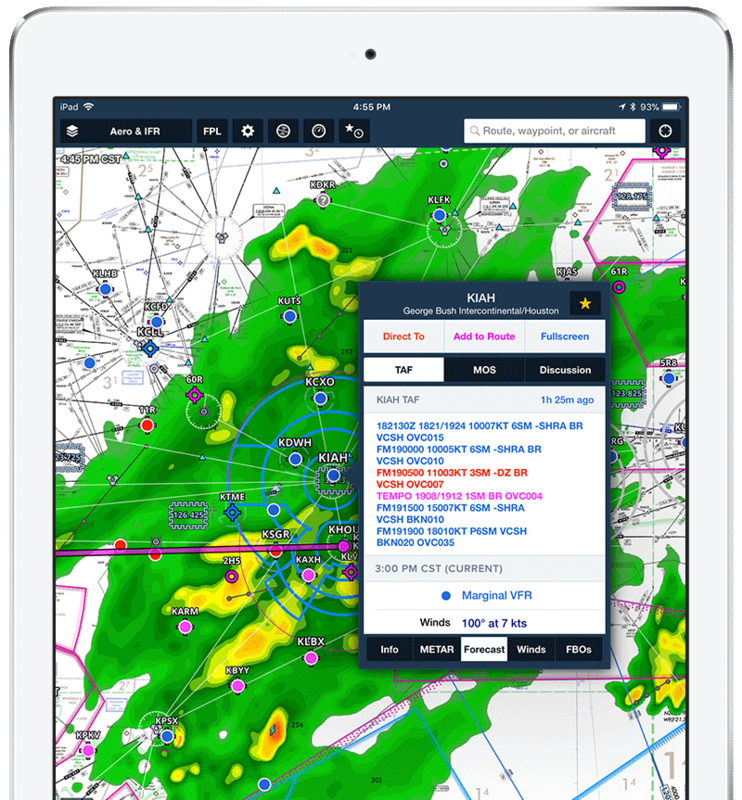 ForeFlight offers a wide range VFR, IFR, and specialty charts, including: ICAO Charts, Terminal Area Charts, VFR Flyways, Helicopter, Grand Canyon, and more. You're covered, whatever or wherever you fly. 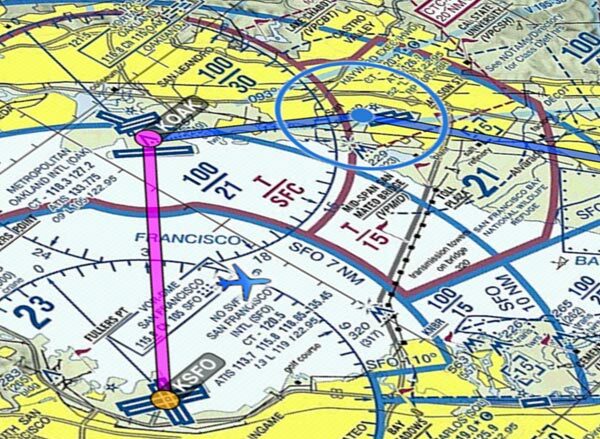 VFR and IFR charts from the FAA, NAV CANADA, EUROCONTROL, as well as other sources to give you everything you need for any type of flying. 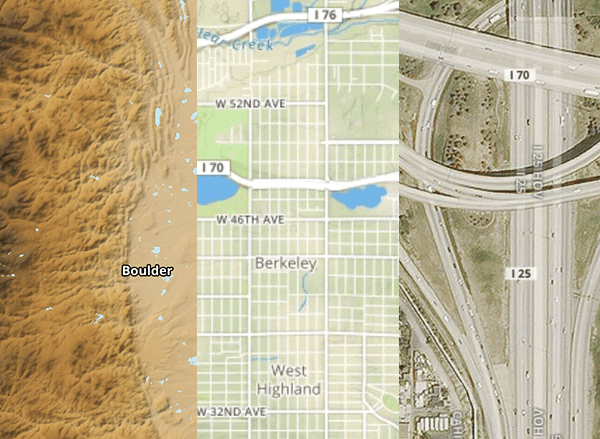 Find useful information at every zoom level with this customizable, data-driven map layer, complete with embedded airport diagrams. Get the full picture with dozens of interactive map layers for weather, hazards, surface maps, fuel prices, and imported custom content. 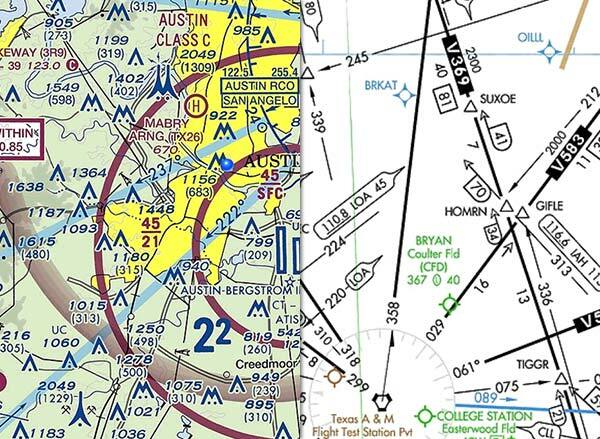 SIDs, STARs, and geo-referenced approaches and taxi charts help you find your way in the air and on the ground. 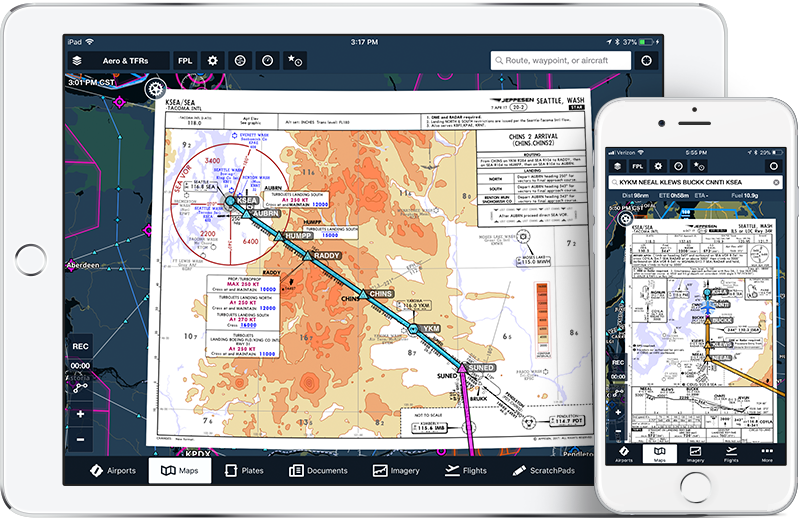 Jeppesen's worldwide library of charts are available as an option in all ForeFlight Mobile subscription plans, making it your all-in-one solution for planning, briefing, filing, flying, and logging flights. 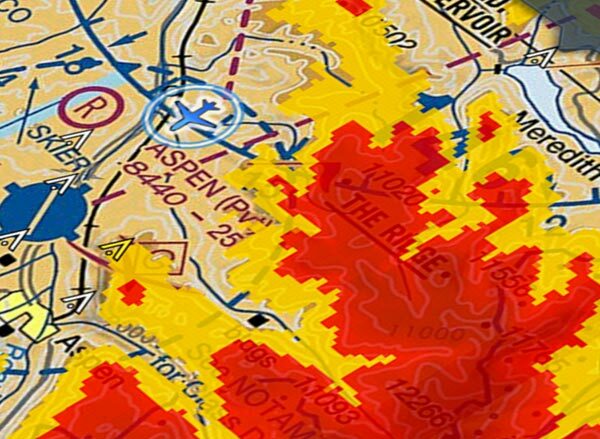 A rich library of weather products and a one-of-a-kind graphical preflight briefing will get you to your destination faster, safer, and probably a bit drier. 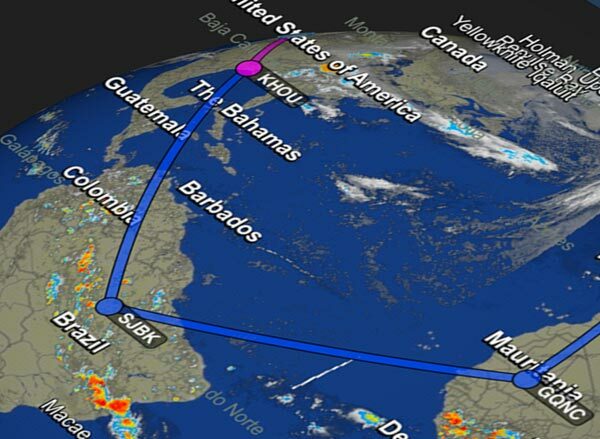 From animated radar to graphical AIR/SIGMETs to global Winds Aloft, over a dozen map overlays ou exactly where the weather is in relation to your planned route. Hundreds of detailed current conditions and forecast weather imagery products at your fingertips. Translated text and full-color graphics help you better understand and consume briefing information. Planning to get from A to B used to be a chore. Not any longer. 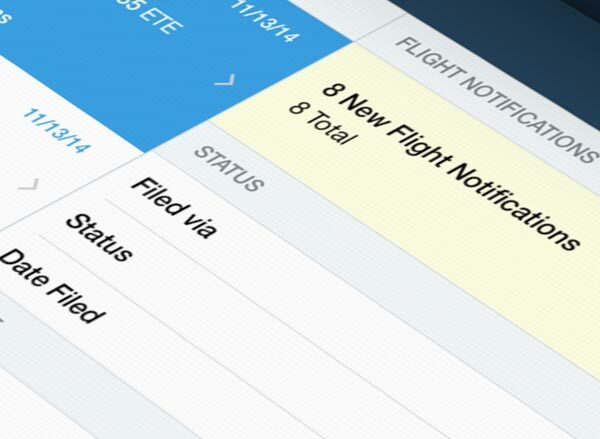 ForeFlight Mobile is designed to boost the speed and efficiency of your planning, briefing, and filing workflow. 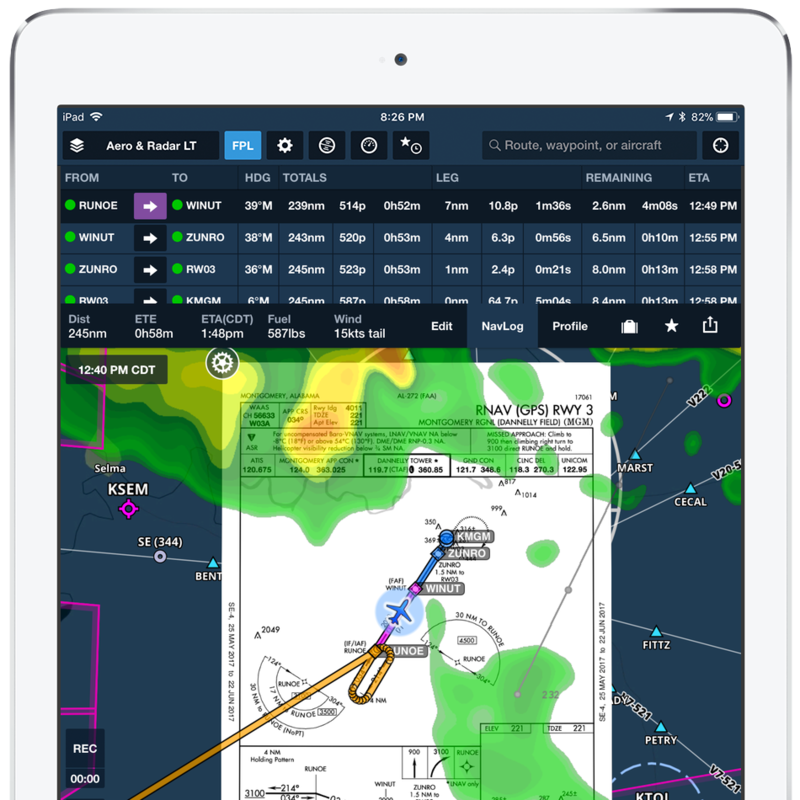 ForeFlight gives you the flexibility to use graphical Touch Planning™ on the Maps view or the full-featured form-based planner in the Flights view. Be sure to add performance data to your aircraft profile for better fuel consumption and wind-adjusted flight time. File days ahead of time, amend plans, activate and close VFR flight plans, and get instant, comprehensive, recorded weather briefings. Drag. Drop. Fly. It's that easy. 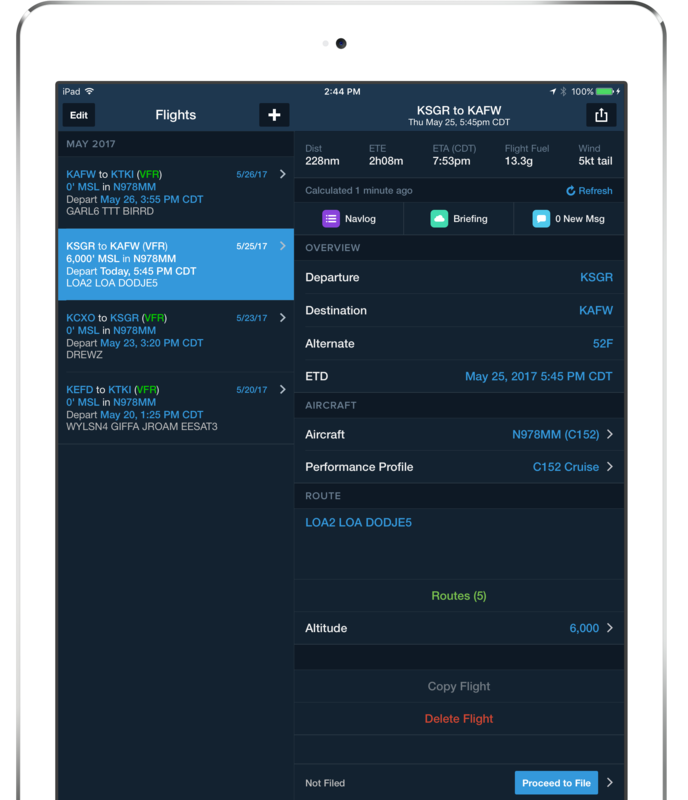 ForeFlight Mobile's Touch Planning feature puts you in control of where you go and how you get there. All with a single tap. Receive in-app notifications when conditions along your route of flight change between when you filed and your departure time. Select and visualize Standard Instrument Departures (SIDs), Standard Terminal Arrivals (STARs), and even traffic pattern entries. Easily add any procedure to your route with a tap. Where is the best tailwind? Altitude Advisor knows. See wind strength, direction, and re-computed total time and fuel burn for every altitude. A visual preview of automatically computed route options recently assigned or cleared by ATC, official preferred routes between airports, and terminal enroute control routes. Fly fast? 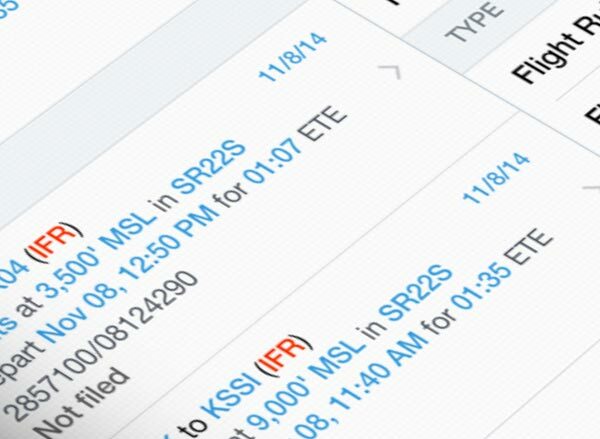 Plan faster with ForeFlight's next-generation flight planning solution. 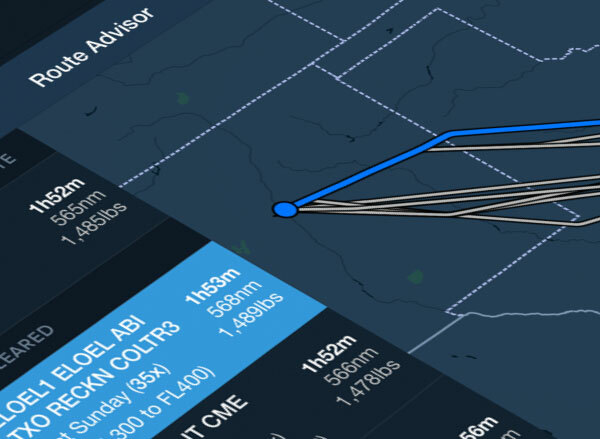 Plan, brief, and file wind-optimized routes for your high-performance aircraft in a matter of seconds – on mobile and on the web. 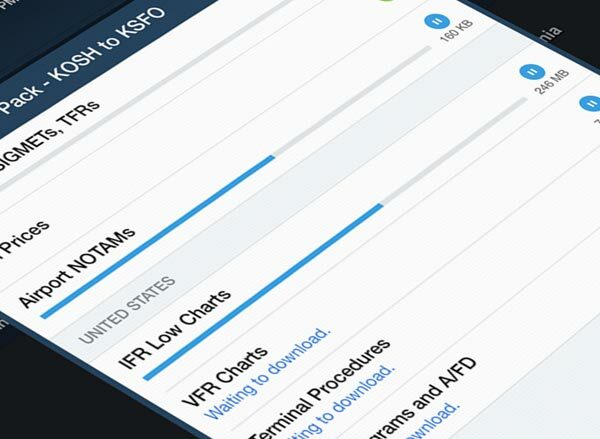 File your IFR or VFR flight plan in seconds, from within the app or on the web. Our dual AFTN connections on two continents ensure reliability in transmitting filed flight plans. IFR flight plan filing is supported in the U.S. and its territories, Canada, Mexico, the Caribbean, Australia, and all EUROCONTROL member states. ForeFlight also supports filing intra-Canada and cross-border VFR flight plans between the US and Canada. Broader support for VFR filing via EUROCONTROL is coming soon. Hazard Advisor highlights hazardous terrain and obstacles nearby. The display is updated constantly based on GPS altitude and position. 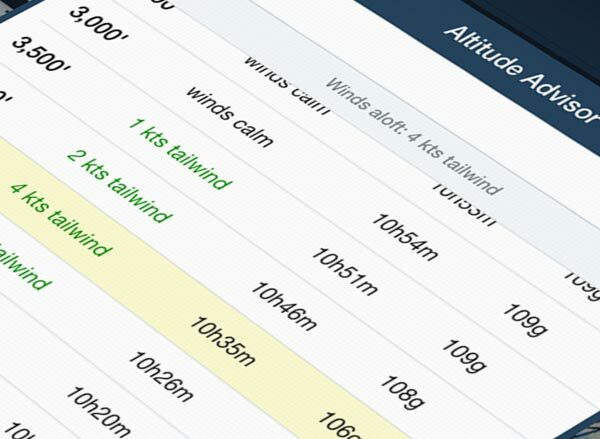 Profile view takes our Hazard Advisor feature into vertical mode and gives you a side view of terrain and obstacles along your planned route or ahead of your aircraft. 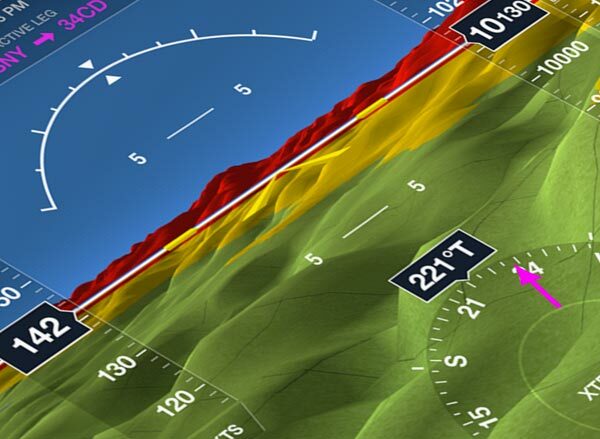 ForeFlight Synthetic vision is the most widely used mobile synthetic vision system. Fast, elegant, and precise, with features like night mode and luminous terrain. Run through your checklists with ease and reduce cockpit clutter with ForeFlight Checklist. Digital checklist templates keep important safety procedures organized and easily accessible for every phase of flight, and helpful color-coding leaves no step left unchecked. 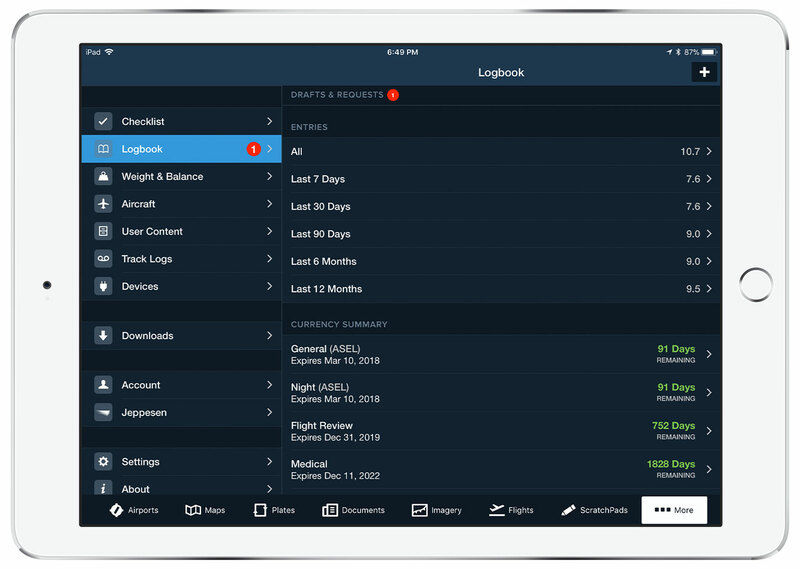 Logbook is built-in to the ForeFlight app and securely syncs across all your devices, making it easy for pilots to log and share flights, track hours, review currency, record certificates and ratings, receive electronic instructor endorsements, and generate experience reports. 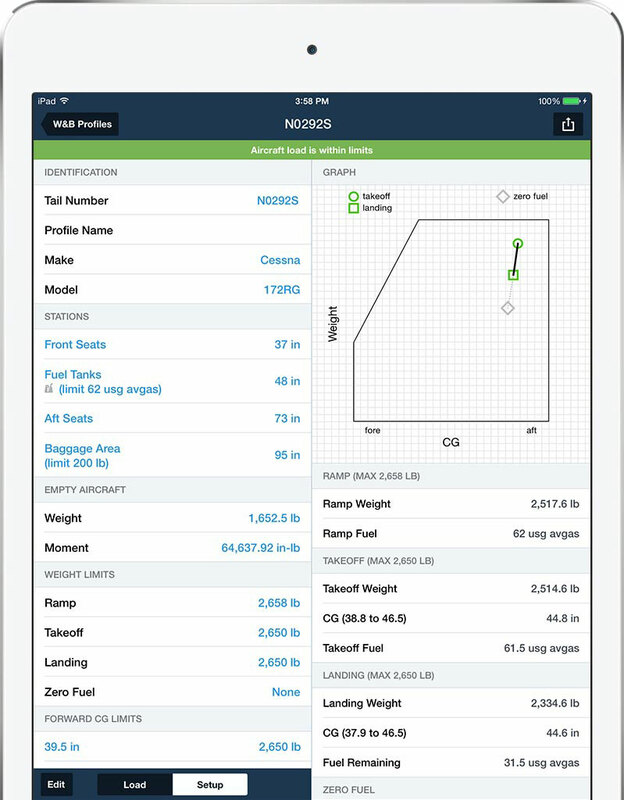 The best weight and balance feature in a comprehensive flight support app. Pre-loaded with over 100 aircraft models for easier setup. Our weight and balance configuration technology walks you through an interview, helping you build the perfect setup using your aircraft’s type certificate information. With ForeFlight, staying up to date with the latest charts and plates is easy. Simply select the types of data you want, the areas you want it for, and tap "Download." When the FAA or NAV CANADA issues new data, the app will notify you and allow you to update with just a tap. 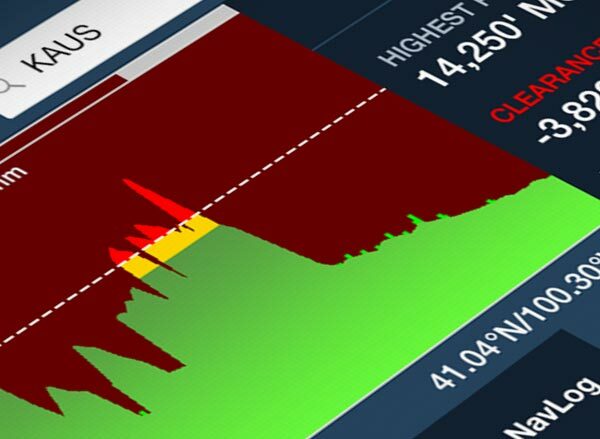 Keep your charts and data current automatically. Database and document updates start downloading when they become available and when the device is connected to Wi-Fi. 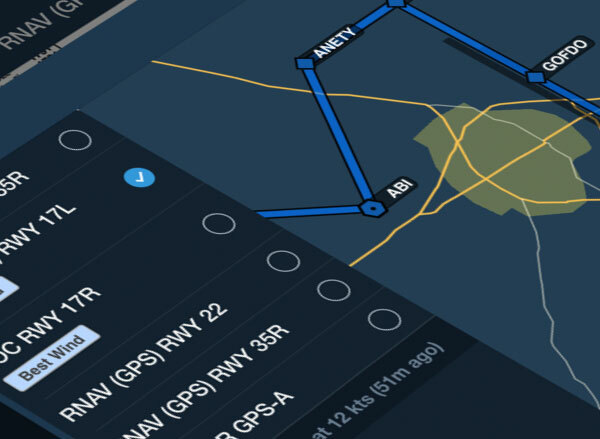 ForeFlight delivers navigation data that covers the globe. 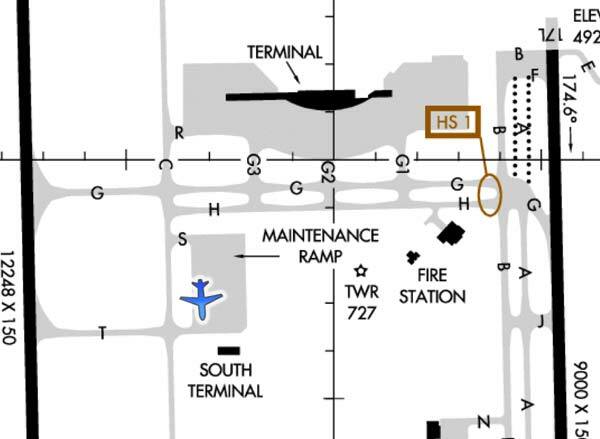 Worldwide airports, navigation aids, airspace, airway, SID/STAR, and approach procedure data are all included. Going on a long cross country? Pack makes sure you have the charts, NOTAMs, weather, fuel prices, and airport information you need. 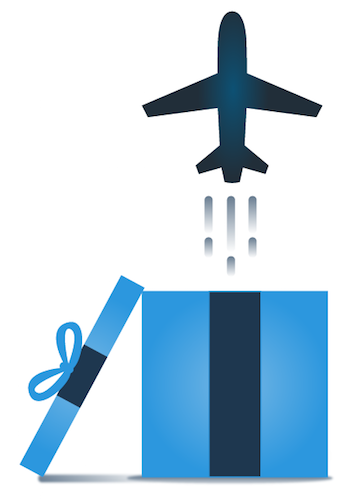 ForeFlight is the perfect gift for any pilot. 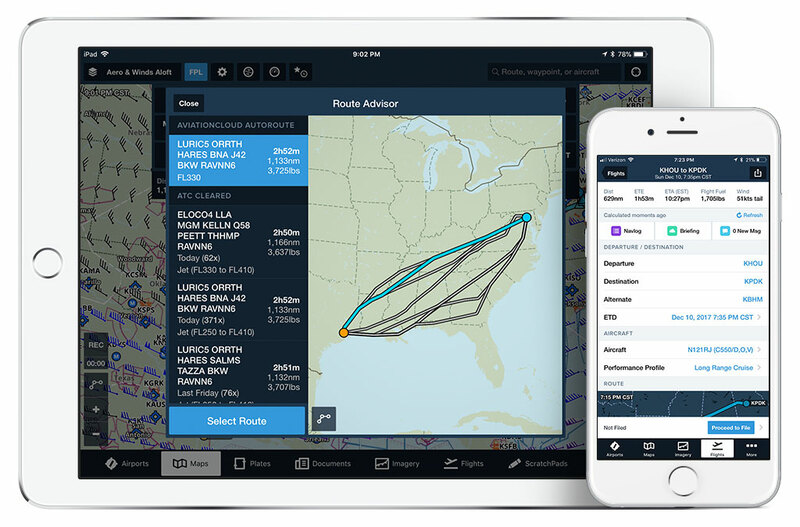 They can gather preflight weather and destination information, route plan, access and manage electronic charts, organize flight publications, log flight time, reference a moving map, and more – all in an elegantly designed app that syncs from the web to mobile. 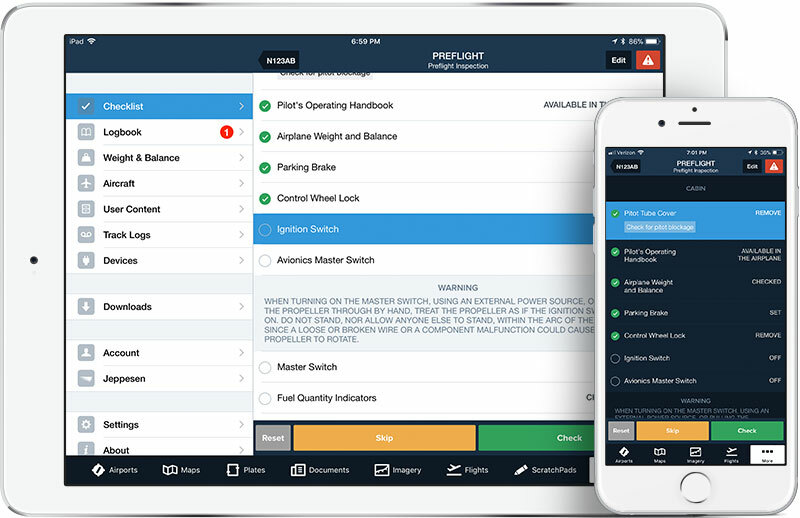 A continual stream of product enhancements means ForeFlight is the gift that keeps giving throughout the year. Certificates are available in $300, $200, $100 denominations. We’re here to help. 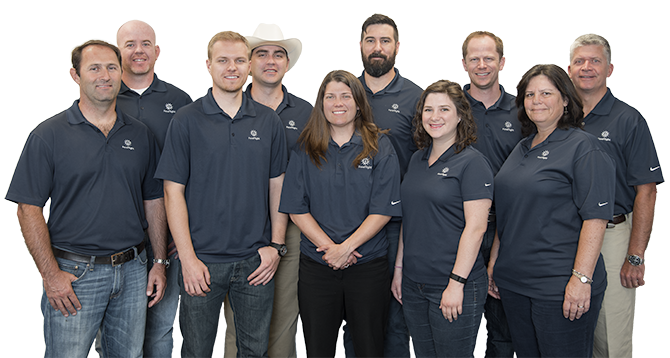 Every support team member is a pilot and ForeFlight expert.